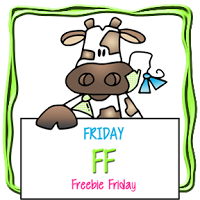 Welcome to Catch the bug and Free Friday..
You can find the free image at the Bugaboo Store.. This is the cute image called M Moo Garden... I chose a Simple Stories designer paper with lots of flowers.. I wanted to keep with the brown theme also since the cow was brown. I added blue ribbon to the side.. I usually don't do bows cause I never like them but this said it needed it so I managed to create.. I actually tied the bow and added it to the taped down strip of ribbon.. I cheated but this way the bow lays how I want it to lay and not all wonkie.. I used MFT circle die and the sentiment is from PTI.. I used my cloud template for the background. Colored the image with copics and added SU punched flowers and finished the flowers with half pearls in the center. 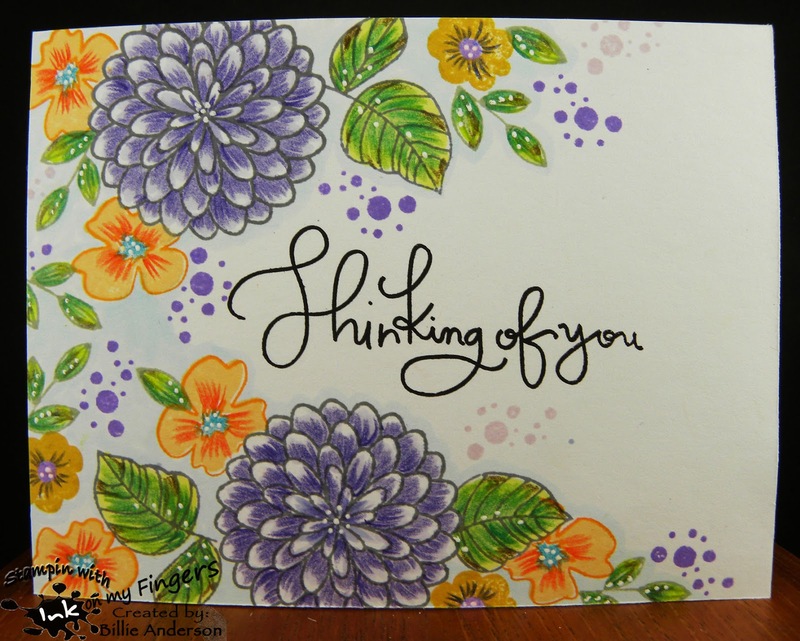 You know how hard it is to make a card and not put a sentiment on the front when you are always suppose to have one on the front or at least inside - but I NEVER put sentiments on the inside.. I know with the different DT's I am on I know the rules.. So this was a little different. Especially when I die cut the sign post.. but I saved it by adding an arrow.. I first took Ranger ink and created the background from ground to clouds.. I spritzed with water and dried. 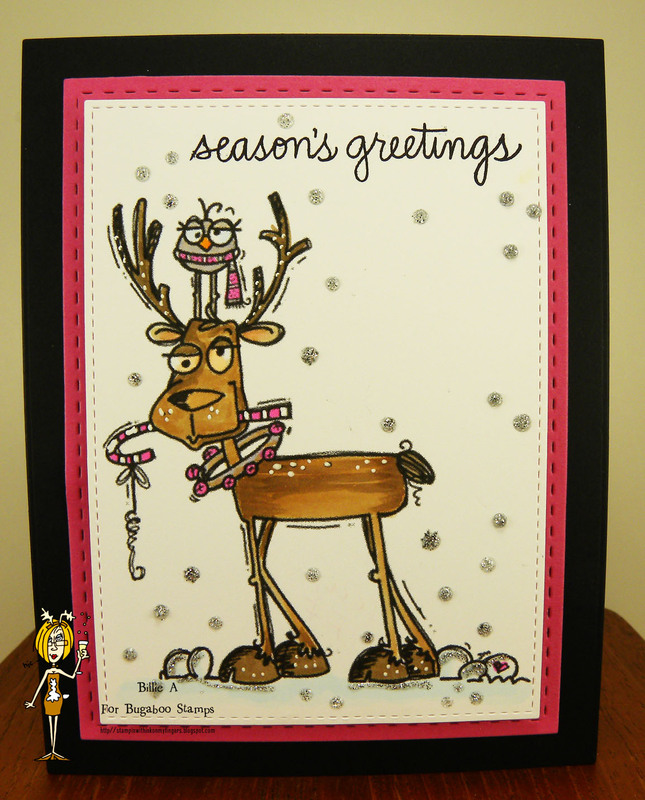 I then used Taylored Expressions and added the trees with Stampin up green ink. 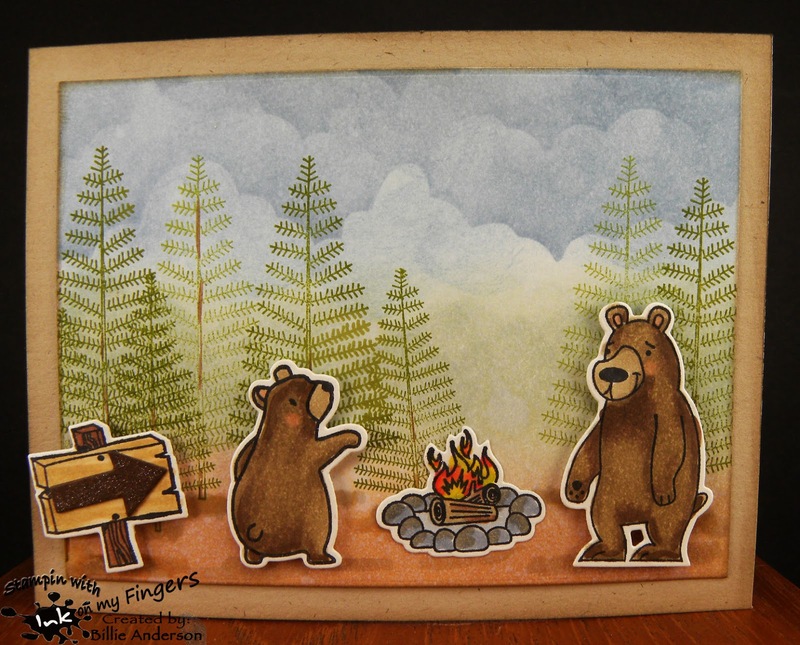 I then die cut big bear/fire/sign post by Taylored Expressions and the smaller bear from Mama Elephant and arrow from My Favorite Things..I colored them with copics and added them to the front of the card. I then took the Happy Trails to you sentiment and camper trailer and stamped it on a piece of scrap paper and die cut the camper and sentiment. 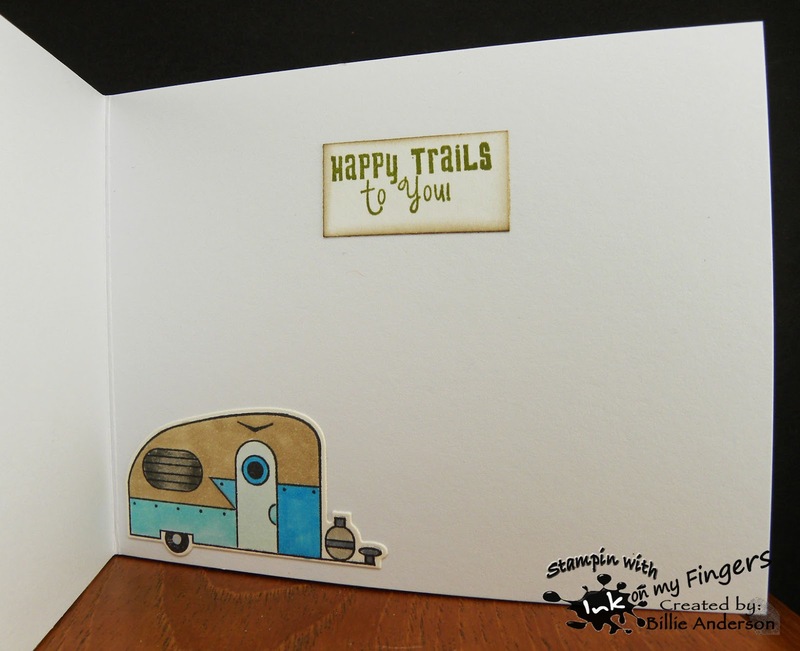 I distressed the edges of the sentiment and colored in the camper and added to the inside of the card.. I added spectrum noir glitter pen to the fire and arrow. I think this would be fun for someone going on a camping trip. 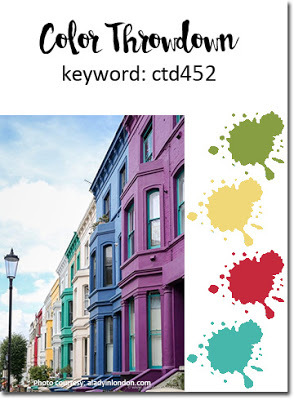 This is the card I made with the above color challenge. I can see with my computer the bottom color looks more fuchsia .. Hum. Well this is my card. I did a technique that Jennifer McGuire did awhile back where she painted on water color paper and then used plastic wrap and laid it over the wet painted paper. You just kinda scrunch the plastic wrap. I did it in little folds across the water color paper. You set it aside and let it dry. So I took my Kuretake paints and plastic wrap and this is what I created. I thought it looks like a great Africa scene so I used My Favorite tree die and the tree greenery is from one of my old Gellli plate creations. The trunk I just used brown paper and I added the wood grain with Paper Trey Ink wood stamp. 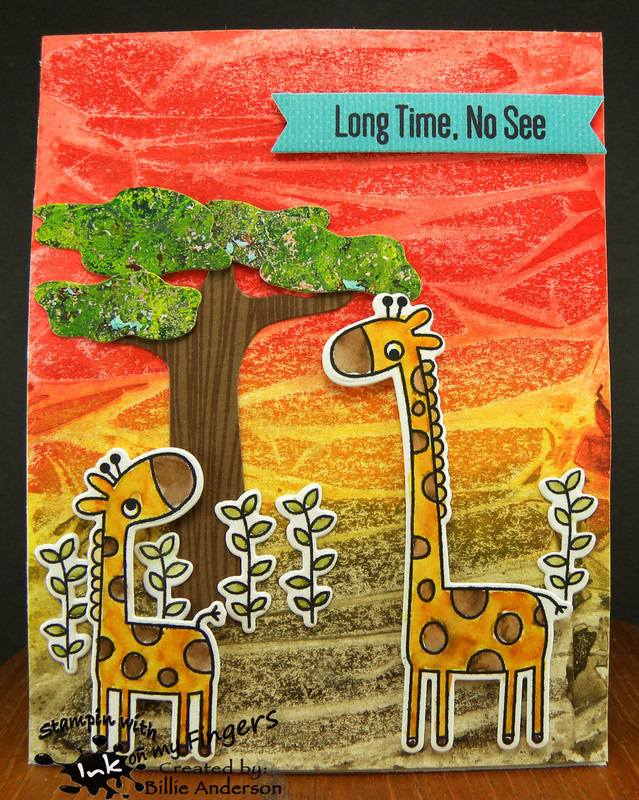 I stamped and die cut the giraffes, greenery and colored them with Zig water markers. I stamped the sentiment also from My Favorite Things on teal paper and used the My Favorite Things banner die. I am loving the way the background came out. If you haven't tried this technique you need to. You will love what happens. We have a fun image for you to use for todays challenge. You can find the Free Friday on the Catch the bug blog. 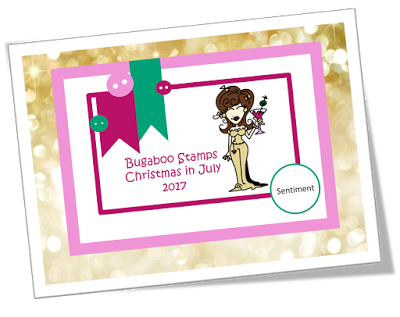 It's the last of the Christmas in July week long fun filled challenge. I sure hope you had fun. It's awesome seeing so many great entries. The recipe for this challenges is.. I did the BLACK, the WHITE is what the image is on and the POP OF COLOR is the pink.. I added SPARKLE on the snowflakes and snow on the ground. I used Lil inker stitch die cut and My Favorite Things stitched die cut. I colored the image with copics and added white gel pen dots. I used Simon Says sentiment. Nuvo drops in glitter silver is what I used for the snowflakes and ground snow. 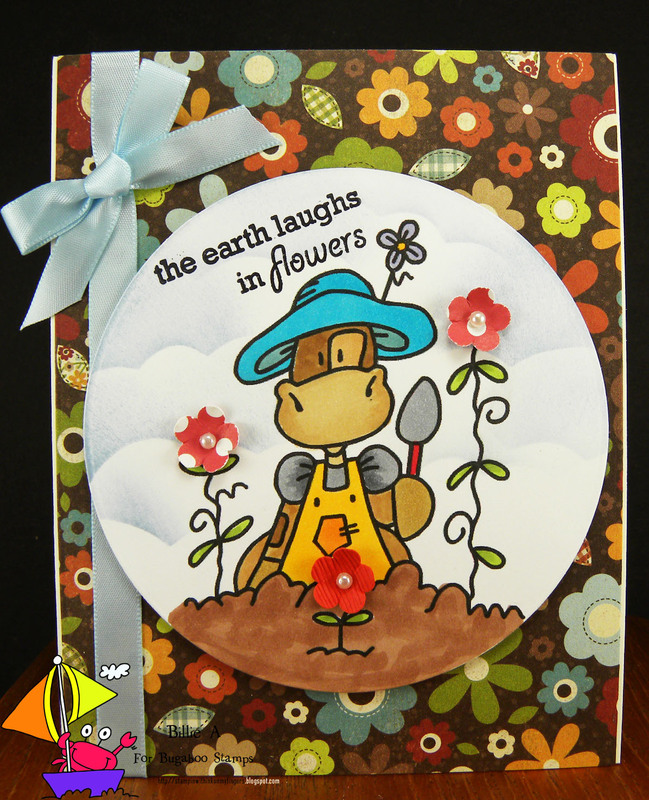 It's Oldie but Goodie for us.. but you just need to follow the photo below to give you inspiration for your card.. 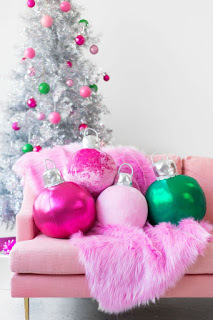 These colors are right up my mom's alley.. She loved to use the fun pastels. I miss her so much. Christmas was a special time of the year for her. She would have a couple Christmas trees all set up beautifully and the house decorated. It was a special time..
Well on to my card.. 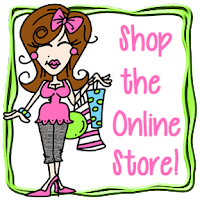 I am using Bug Elf.. You can find in the Bugaboo store. I used a lot of the colors in the photo and added the strip behind the image that have some of those colors. the card stock is a shiny silver but it's hard to tell. I used copics, glitter and Nuvo drops and Spectrum Noir glitter pen. The stitch die is My Favorite Things. This is my card. I used Ornament Moose which you can find in the Bugaboo store.. I added some of the colors from the photo. I created the background using a Simon Says stamp and lightly colored the packages. 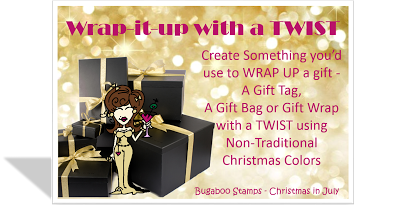 With the Bugaboo image so colorful I wanted to keep the background soft. I love the funny look on the moose face. I stamped a Paper Trey Ink sentiment in the little area. I added some Spectrum Noir glitter to the image. Day 4 of Christmas in July at Catch the bug.. It is also the New Release day at Bugaboo.. 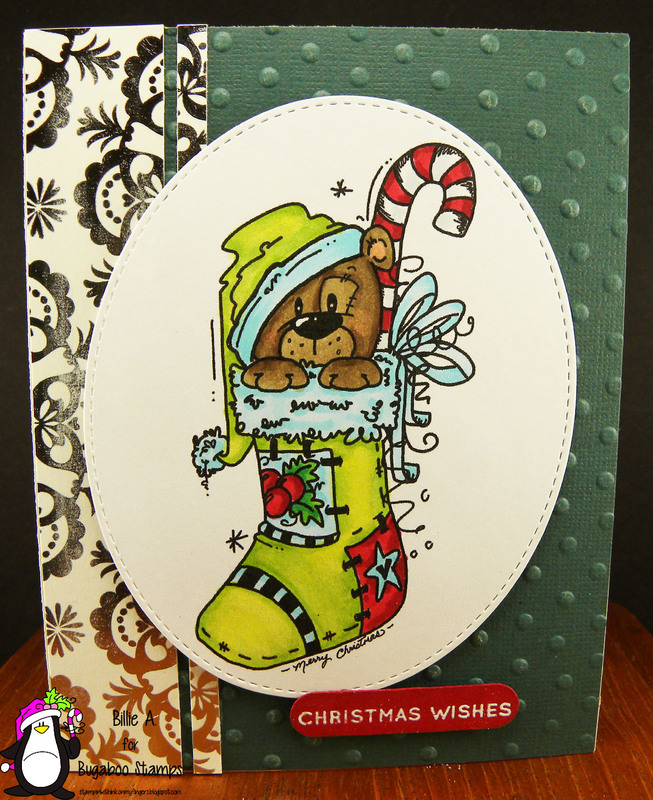 This is the card I made using the new release Bear Stocking which can be found in the Bugaboo store. Cute huh.. I also chose the first row going down. Sparkly, Sentiment, Embossing.. 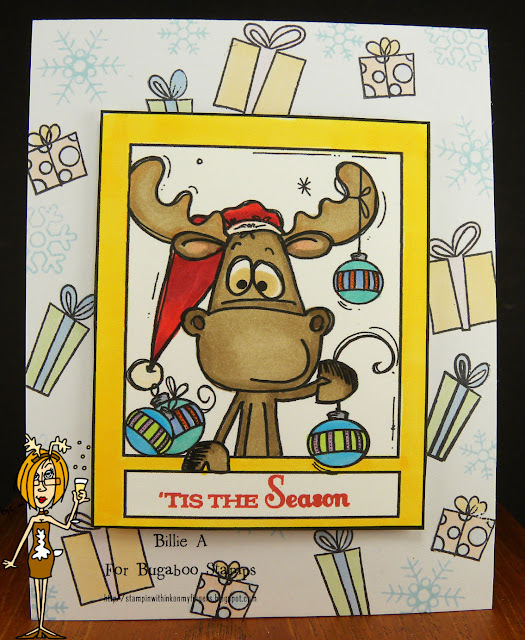 I embossed the background with the large dot embossing folder. I added the sparkly which is an awesome foil paper I did a wide strip and narrow strip and added to the side. I used Simon Says Christmas stamp and embossed in white and used my Stampin Up punch and added it to the bottom. I cut the image out with My favorite thing oval stitch die. The image is colored with copics and I used Wink of Stella and my Spectrum Noir glitter pen on different parts of the image. I hope you play along with our Bingo Tuesday and cant wait to see what you created. So many awesome cards have been posted for our Christmas in July. I chose to make a gift bag.. I used an old Paper Trey Ink die and added a bottom piece to connect the die pieces. It's open on the side. You can adhere something inside or clip it. I've put apple cider or hot chocolate packs. You can use a little piece of reposition tape to hold in place. I chose to use the image Peace, Love and Joy angel for my image. I chose to use yellow green and purple for my non traditional colors. I used a purple ribbon to tie the bag together. I used Spectrum Noir glitter pen on the wings, halo and stars. Hope I inspired you to play along and figure out what to make. Well it's another challenge for Billie and Monika of Creative with Monika It's a challenge we just do between ourselves. We've been doing this for a few months.. This will be our last one till end of summer. Monika has kids out of school and it's just a busy time for her.. I really look forward to the challenge. She is very inspirational. 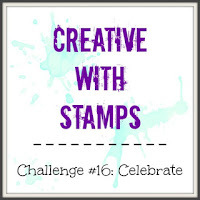 I am just using stamps.. no designer paper and we challenge each other to different themes. I chose for two months and she chooses for two months .. so on and so on.. This is my month to chose so I chose flowers.. but they need to be in Purple, Orange and Yellow.. of course it's ok for the leaves to be green.. These are a few of my favorite colors.. I used Simon Says stamps from 3 different sets. I stamped and masked. I used Ranger inks, copics and colored pencils. ( I need to remember this purple flower and try again.. I love the way it came out) I used white gel pen to give some added highlights. I watch the Daily Marker videos and she talks about the sweet spot on the flowers.. leaving the white areas.. Also adding some brown spots to leaves.. leaves have brown spots.. at lease mine do.. 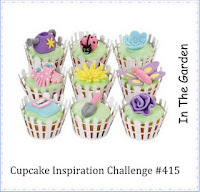 I hope you enjoy and I hope you head over to Monika's blog and see what she created.. I know you will love it. 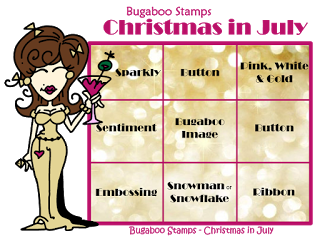 It's day 2 of the Christmas in July at Catch the bug ..
Are you having fun seeing the fun challenges? I hope you find time to play along.. You could get 7 Christmas/Holiday cards made for this season.. I can always use more and more..
Our challenge today is this below sketch. Follow the sketch.. 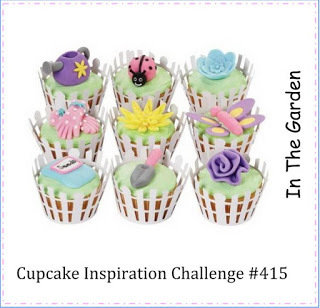 Mid month reminder that we still have Celebrate theme challenge going on.. You have time to enter your creation. 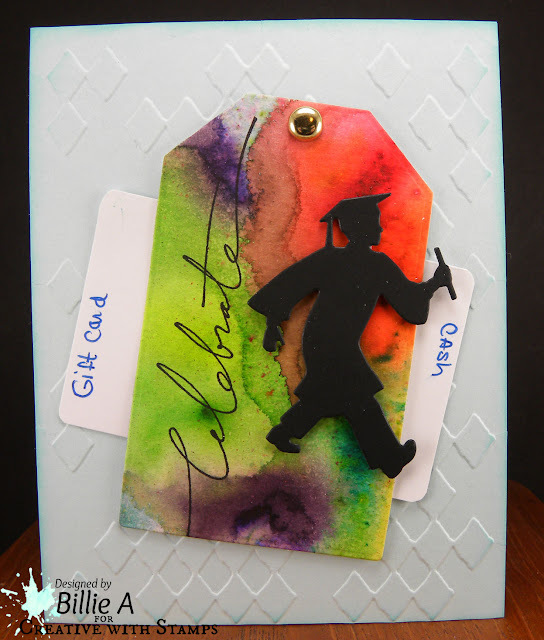 Sticking with the graduation theme for card.. I made another using the male silhouette die from Impression Obsession.. I took some watercolor paper and added some Ken Oliver color burst powders and spritzed till I got the effect I wanted. I dried and using Marianne tag die cut it out. I added a Gold brad to the tag hole.. 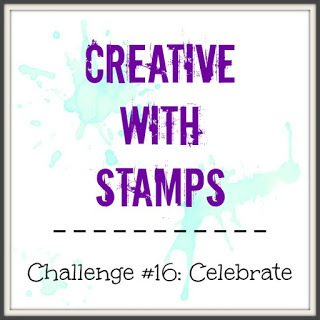 I then took my Celebrate Stampin up stamp and added it to the side of the tag. I then mounted the male grad to the tag. I dry embossed the blue and went around the edges with Quick Quote ink to distress the edges. I added foam tape to the top and bottom only of the tag and mounted it to the embossed front. I measured out a gift card and rounded the corners and wrote gift card/money so who ever uses this would just remove the example I made and add their own gift card or money.. I thought it was a good idea. Simple and fun. 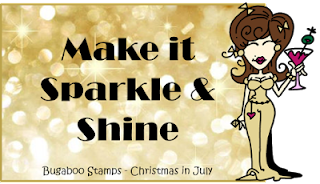 I cant wait to see what you all make for a celebrate card..
Its day 1 of Christmas in July at Catch the bug.. It's a week long fun filled challenges. There's prizes to be won.. Who doesn't love free images?? Sparkle or Shine or both.. I used the image Snowbirds . 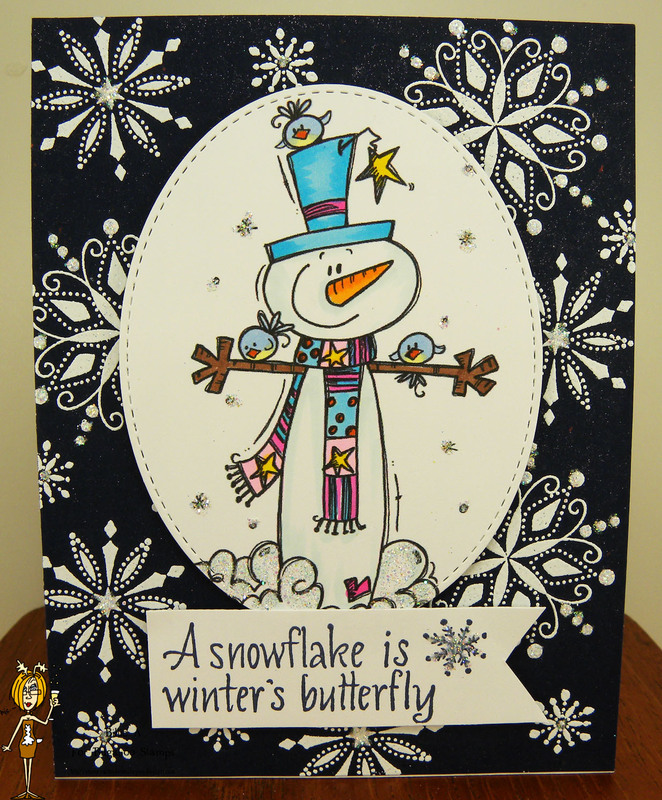 I first used a dark blue card stock and Stampin Up snowflake stamps. I heat embossed in white.. I then took my Wink of Stella glitter pen and went all over the dark blue to give it sparkle.. 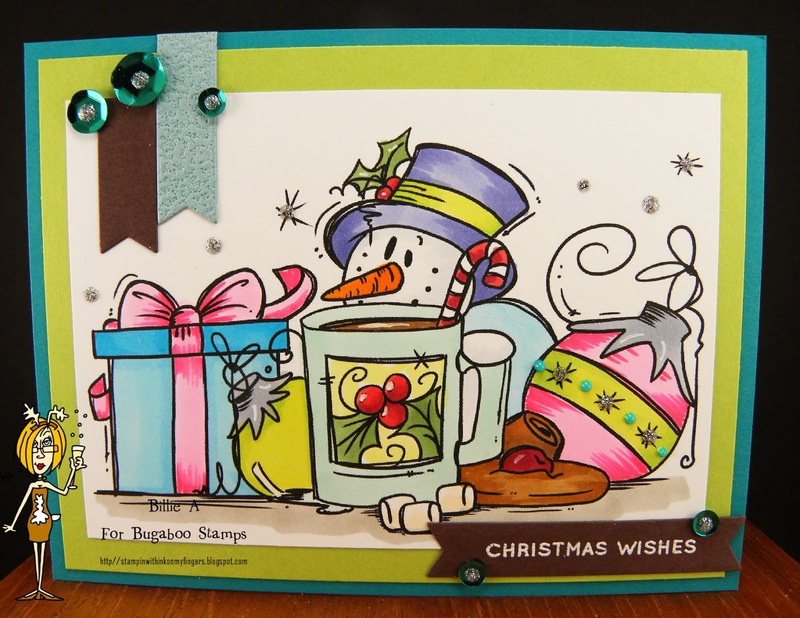 The white embossing powder gives it shine.. I then colored the image with copics. I added glitter to the snow and to the snow flakes falling behind the image. I then added glitter to different parts of the snowflakes on the dark blue. 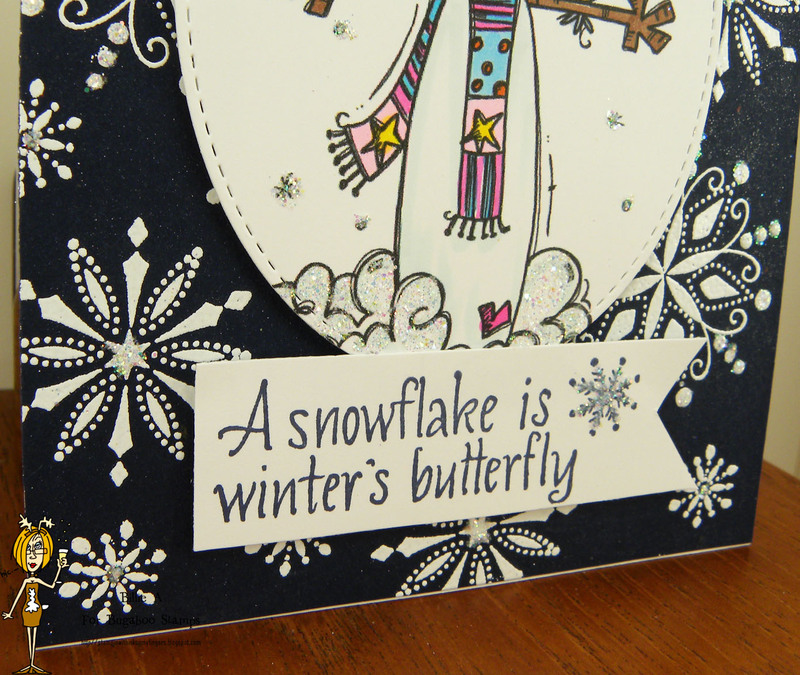 I stamped the Hero Arts sentiment and added glitter to the sentiment snowflake. I used a My Favorite Things oval die. This is a close up of my card.. on the right side you can see the Wink of Stella on the dark blue. The glitter on the snow and few places on the snow flakes. Plus the shinny white embossing..
it's time to get some Christmas cards made.. Here is a good start. 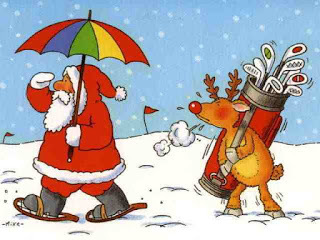 Well I am always up to getting Christmas card made before the deadline so this worked out perfect... I am using the fun image called Christmas girl sitter... 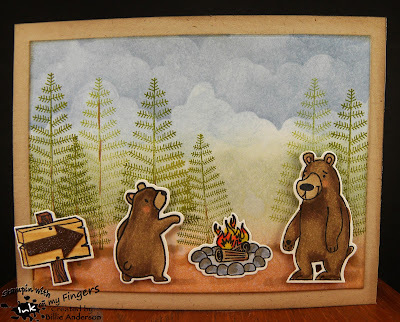 I used a Tim Holtz stencil and did the brick background with Ranger inks. I then die cut the circle with My Favorite Things circle scallop die and colored the background inner circle with Ranger and spritzed with water. I adhered it to the card base and added the brick wall with foam tape over card front. I added the scallop frame inside. I was going to have it raised with the wall but it just didn't look right. 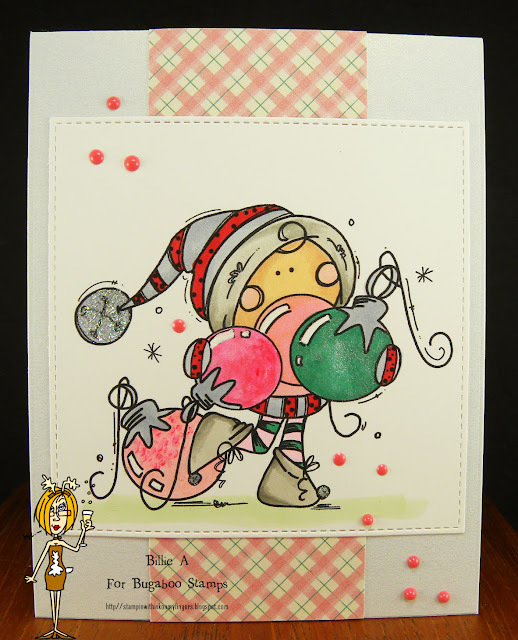 I colored the Bugaboo Christmas girl and used foam tape and added her to the circle edge. I stamped and die cut the holly /berries from Paper Trey Ink and added them along with the Simon Says sentiment embossed in Platinum embossing powder. I added some half beads as holly berries. I really like the fun look. Hope I have inspired you to play along. Please check out the design team and see what they created for this challenge.